Demand across Phnom Penh’s office market is principally being driven by multinationals from the international financial services sectors. Supply in 2014 has increased after seeing limited space come onto the market in 2013, with a notable increase in quality recently delivered by Vattanac Capital. Phnom Penh can now boast office segmentation, with a range of quality-grade options offering available space. 2014 should see approximately 52,000 sq.m of new office supply delivered, with 17% of total supply now attributed to the recently launched office component of Vattanac Capital. The highly anticipated development launched 23 storeys of grade A accommodation in Q2 2014, delivering a new level of space to Phnom Penh’s expanding office sector. A number of smaller developments are also due to come on-stream over the course of 2014. A further 15,000 sq.m of grade B/C space is set to arrive by Q1, 2015. The Bridge, a joint venture between Singapore’s Oxley Holdings and Cambodia’s World Bridge Land, scheduled for completion by 2018, recently launched the off-plan sales of their Small Office Home Office (SoHo) concept, located within the mixed-use development. Occupancy rates remain broadly positive, with the majority of Grade B/C multi-tenanted office buildings enjoying occupancy rates in excess of 90%. Overall occupancy rates decreased in Q2 as new supply arrived onto the market. The majority of office space in Phnom Penh is still low grade by international standards, with Grade A and B+ properties equating to 33% of current stock. The majority of new demand can be attributed to multinational corporations, in sectors such as banking, finance and securities, moving towards larger floor plates, with requirements typically in excess of 250 sq.m. Parking provisions remain a key requirement of the majority of tenants, with various measures being taken by office buildings, such as Phnom Penh Tower, to provide further parking facilities, principally as a result of high occupancy levels. The prime-rent index across Phnom Penh shows an annual growth rate of 10%, with further prime rental growth expected by the end of 2014. A lack of new supply in 2013 saw landlords increase rents in accordance with the performance of their buildings. Rents across all grades increased, as lower grade properties capitalised on the lack of available space within Grade-B or above buildings. Increased occupancy in Grade B+ properties drove rents to in excess of $20/sq.m, with Vattanac Capital achieving rents in excess of $30/sq.m, highlighting the increased requirements of tenants to establish themselves within quality commercial developments. The growth in achieved rents across the market can be attributed to steady international demand. Across all international office grades, the current market average rent per sq.m stands at $20. Cambodia is likely to remain favourable to international business, throughout 2014 and into 2015, as integration with the Association of Southeast Asian Countries (ASEAN) comes into force next year. This is anticipated to further stimulate demand for office accommodation from regional occupiers. Renewed interest in Phnom Penh has been observed following the recent ending of the political deadlock between the ruling Cambodian People’s Party (CPP) and the Cambodia National Rescue Party (CNRP). An agreement reached at the end of July led to CNRP legislators resuming their seats in the National Assembly . The following terms and conditions usually apply to office leases in Cambodia, but should be used as a guide only. Professional legal and surveying advice should be sought before entering into any binding contract. Lease Length: Generally, leases for commercial office space in Phnom Penh are for two years or longer. It is possible to have a lease term for less than two years, but landlords usually request a higher rent for the increased flexibility. Service Charge/Management fee: This usually pays for all costs incurred running the building such as routine maintenance of all major plant & equipment, security, cleaning etc. Most older office buildings in Cambodia do not charge separate management fees, but for newer buildings the management fees are between $2-5 psqm. In more mature markets, audited accounts of the expenditure are provided to the tenant at the end of the year, but this does not happen yet in Cambodia. Deposit: Dependent upon lease term, but generally 3 months’ gross rental, non-interest bearing, refundable upon expiry of the ease subject to performance of rent and repairing covenants. Rent-free fitting out period: The amount of office space leased, the cost psqm and length of term determine the amount of rent free period. Presently, it ranges from 1 week to 3 months. Fitting-out costs: The capital costs of fitting out, including loose furniture but excluding office equipment, the price can range dramatically from $80 to $400 per square meter. Renewal provisions: There are no statutory rights of renewal in Cambodia and the landlord and tenant negotiate new terms close to lease expiry. However, the lease renewal procedure can be incorporated into the contract including maximum rent increases on renewal to protect the occupier. The condominium market in Phnom Penh is continuing to expand, driven by successful off-plan sales of high profile projects, such as Nuri D&C’s De Castle Royal and Oxley Holdings’ ‘The Bridge’. CBRE has seen a significant increase in investment from Singaporean, Japanese, Hong Kong and Chinese residents. Although the comparatively high yield guaranteed by a number of leading developers is appealing to oversees purchasers, the main driver remains anticipated capital growth. Currently, there are 24 Condominium projects in Phnom Penh, including both finished projects and developments currently under construction. 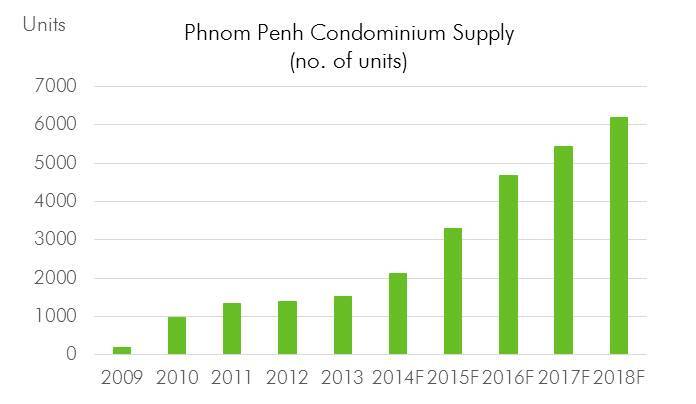 The growing confidence in Phnom Penh’s condominium market continues to drive further development activity with a significant pipeline of planned projects due to come online through until 2018. Phnom Penh is set to experience a significant increase in supply, with De Castle Royal imminently set to deliver 414 condominium units and with Galaxy Residences set to deliver further 44 condominium units in Q4, 2014. Overall supply in Phnom Penh is due to increase by 191% by 2018, driven by large-scale new projects such as D.I. Riviera and Olympia City, both currently under development by OCIC. Impressive off-plan sales rates have been reported by a number of leading developments, with The Bridge’, located in Tonle Bassac, having successfully achieved a sales rate of 85% for the condominium units, within 4 months of launching their sales campaign at an exhibition in Singapore. Achieved prices for high-quality condominium units range from $1,500 – $3,000 USD per sq.m in central areas of Phnom Penh. The Bridge, which is due to deliver a 762 condominium units, in addition to 963 ‘SoHo’ units and further retail space, accounts for the upper figure. Demand for condominiums is anticipated to increase and be met by supply in 2014 through to 2015. The introduction of high quality products in downtown locations will offer prospective investors an opportunity to acquire products that focus on the needs of a heavily expatriate driven area of the Phnom Penh residential market, as foreign nationals continue to require exclusive and up market accommodation in popular locations. Demand is also increasing from an ever more affluent domestic population, which is due to account for a notable proportion of purchasers over the coming years. Domestic demand is a key element of a successful condominium project, due to foreign ownership of an individual building being restricted by law at 70%. Q2 2014 witnessed the sales launch of Oxley Holdings’ ‘The Bridge’ mixed-use development, which comprises a total of 762 residential units. The high off-plan sales rate, which currently stands at 85% , with only one-bedroom units remaining, highlights the strength and appeal of the market to international purchasers, with the majority originating from Singapore. It is important to note, however, that there has been significant domestic interesting in the project. The successful launch of De Castle Royal, which will set a new benchmark for quality in the market, will further add strength to the ever-growing sector. Comprising a total of 414 units, the project has been key in rebuilding confidence off-plan sales market. CBRE note that a number of individuals, in addition to established developers, are making considerations towards the construction of further condominium developments, reinforcing their focus on the market, and furthermore their confidence in it.